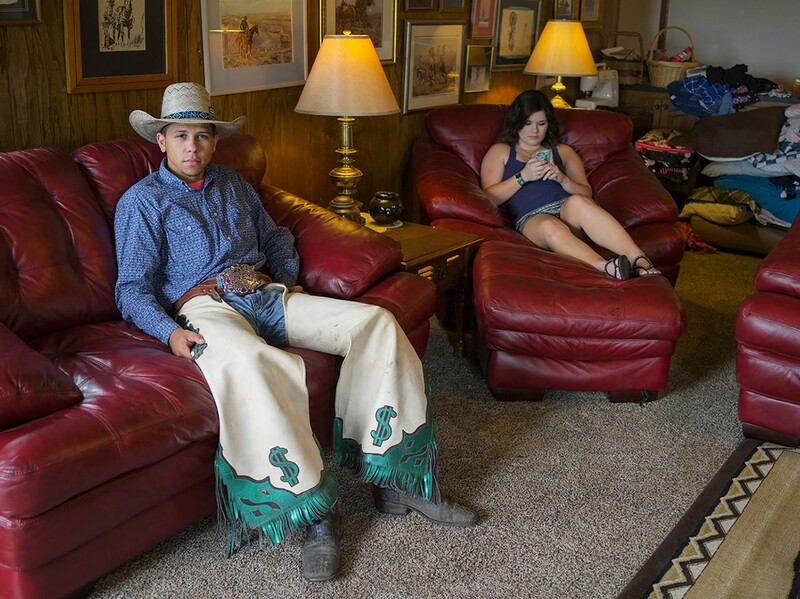 “Native American bull rider wearing his lucky chaps with his wife in the background near Henryetta, OK” © Greta Pratt, from the series The West, 2015 — present. Image courtesy of the artist. The Society for Photographic Education’s annual conference in mid-March, The Myths of Photography and the American Dream, concisely framed ongoing dialogues about what it means to embody our national identity. In her brief but informative presentation of the series The Interpreters and The West, Greta Pratt offered studied insight into how we perceive ourselves individually and collectively as Americans through history, memory, and myth in a performative context. The two series commenced in 2015, not long before the toxic socio-political climate that envelopes us reached saturation, and resonate more profoundly for that context. Both convey individual and collective notions of what makes us Americans, and how performance bolsters those notions, for better or worse, in service of a unique national narrative. In Pratt’s work, “performance” takes on multiple meanings. Azalea Trail Maids (2006), in which high school-age girls in Mobile, Alabama participate in a highly structured, beauty pageant-like competition, highlights the performance of genteel femininity as central to Southern identity. Problematically, such competitions and their sustained popularity ignore historical race, class, and gender bias as factors in both individual and collective identity construction. In The West, exemplified by the Native American bull rider in the image above, performance may be less structured, more self-directed and broadly interpreted. Pratt captures the irony of a Native American man, whose ancestors may have been forcibly relocated if not killed by cowboys, donning professional garb historically associated with settler violence. Throughout her work, Pratt respectfully portrays both institutional and individual expressions or performance of American identity, but leaves a wide interpretive margin in which questions arise. The Interpreters centers on the Jamestown Settlement, a living history museum located roughly 2.5 miles southeast of contemporary Williamsburg, Virginia that comprises reconstructions of the three English ships that conveyed colonists, a Powhatan Indian Village, and James Fort. Founded in 1607, the settlement was the first successful English colony in North America. In May 2019, celebrations commemorating the 400th anniversary of significant events (the first legislative assembly in North America, and the arrival of the first enslaved Africans on the continent) will be held. Each site on the museum complex is staffed by historical interpreters, volunteers who dress in period costumes and perform tasks (farming, cooking, sewing, blacksmithing) while “interpreting” for contemporary visitors the rhythms of 17th century colonial life. These volunteers are the subjects of Pratt’s video. Instead of capturing them in action, Pratt asked participants to pose as though in a human diorama. Their stillness amid life’s movement — leaves fluttering in the wind, chickens walking into the frame — removes their educative charge, and raises questions about why we recite this origin story, who advances and benefits from this history, and who is missing from the narrative? Pratt keenly undermines our collective comfort with and expectation of history films as cinematic learning opportunities. Though The Interpreters — a commission ordered by the Virginia Museum of Art — includes both video and still photography, the former more directly conveys the artist’s interest in performance as a lived or living experience. The still photographs do not include references to the current moment, bearing traces of formal portraiture that while aesthetically appealing, are remote. The video, by contrast, encourages momentary immersion in the scene. 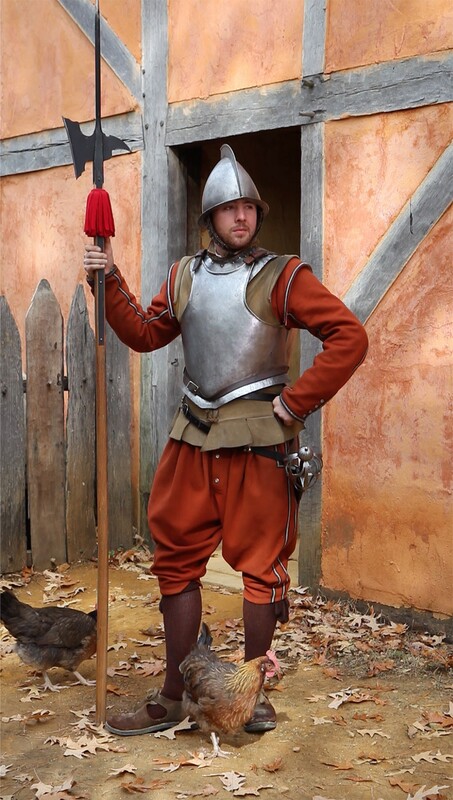 “Interpreter dressed as English soldier guarding the James Fort.” ©Greta Pratt, from the series The Interpreters, 2015 — present. Image courtesy of the artist. “Interpreter needing bread inside a house within the James Fort.” ©Greta Pratt, from the series The Interpreters, 2015 — present. Image courtesy of the artist. 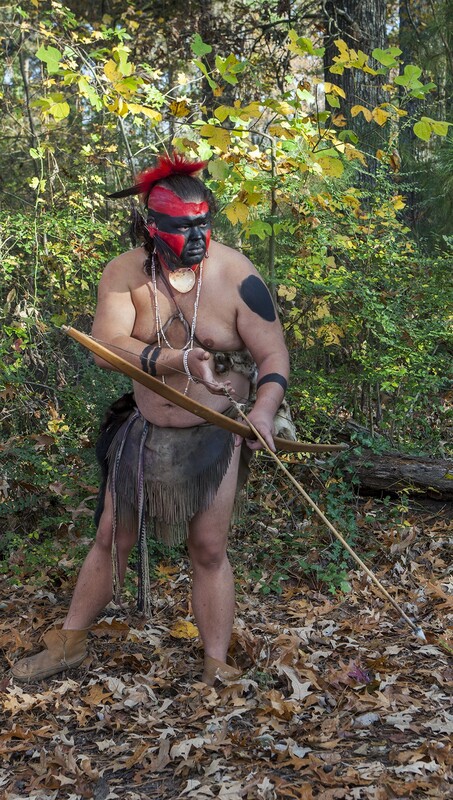 “Interpreter portraying a Powhatan Indian about to go hunting in the Powhatan Village.” ©Greta Pratt, from the series The Interpreters, 2015 — present. Image courtesy of the artist. Photographers arrived in what became the western American states after the Civil War. Motivated by Manifest Destiny, the widely accepted ideology that European-descendant settlers were divinely charged to cultivate and “civilize” the North American continent, white colonists pushed westward. In doing so, they helped establish the wide spectrum on which notions of personal and national identity rest. In the century and a half that has since passed, “the West” has retained its draw for many in search of individualism. In her long-form project, Pratt captures both the aspirational seeking and raw realities of life on the former frontier. Pratt was drawn to the western states after completing the 1994 project In Search of the Corn Queen. The candid, at times arresting black and white photographs featured in her first publication bear the compositional traces of Diane Arbus and Richard Avedon’s In the American West, but thankfully lack the thinly veiled cruelty and east coast elitism that define Avedon’s western photographic escapade. While not as image-dense as Pratt’s earlier projects, The West conveys the breadth of locations the artist visited and the people she encountered along the way, all shadowed by a vague sense of unease. For their distinct costumes and evident personal pride, a vivid portrait of Mormon rodeo queens representing multiple generations in a single family captured my attention during Pratt’s SPE presentation. Equally compelling, an image of well-worn cowboy boots and an abandoned suitcase suggests numerous scenarios; loss of one’s cultural grounding, forced relocation due to employment or housing insecurity, or more enigmatically, arriving at the end of a grinding journey with little to show for it. As a stand alone composition, the boots-and-suitcase photograph could be easily classified with millions of other found-object road trip posts on Instagram. But given its context, and the struggle to define personal and national identity in which the country is caught, Pratt’s photograph takes on deeper meaning. 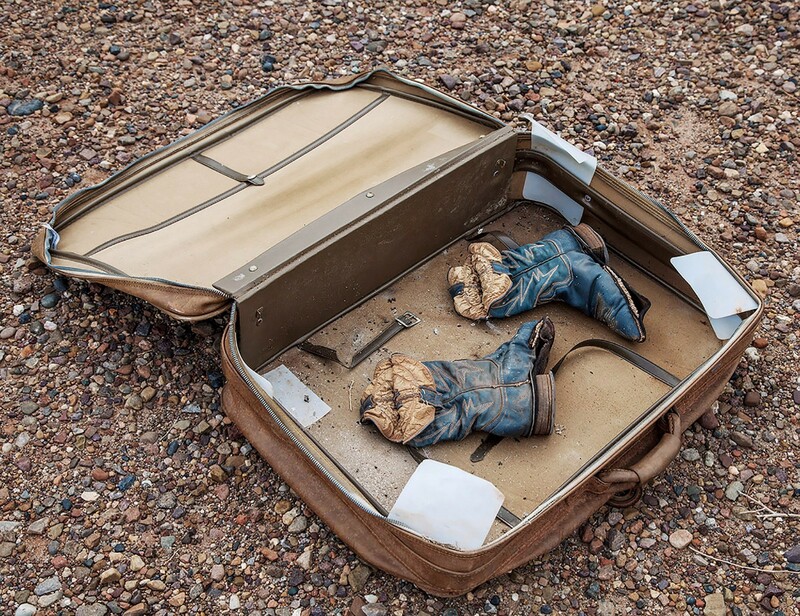 “Abandoned cowboys boots and suitcase found beside the road near Holbrook, Arizona.” © Greta Pratt, from the series The West, 2015 — present. Image courtesy of the artist. 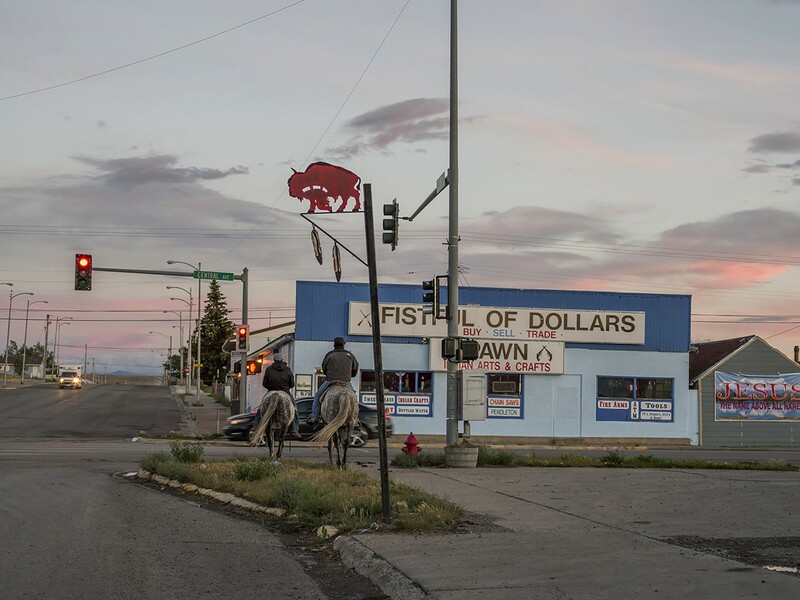 “Men riding down the street in Browning, MT on the Blackfeet Indian reservation.” © Greta Pratt, from the series The West, 2015 — present. Image courtesy of the artist. 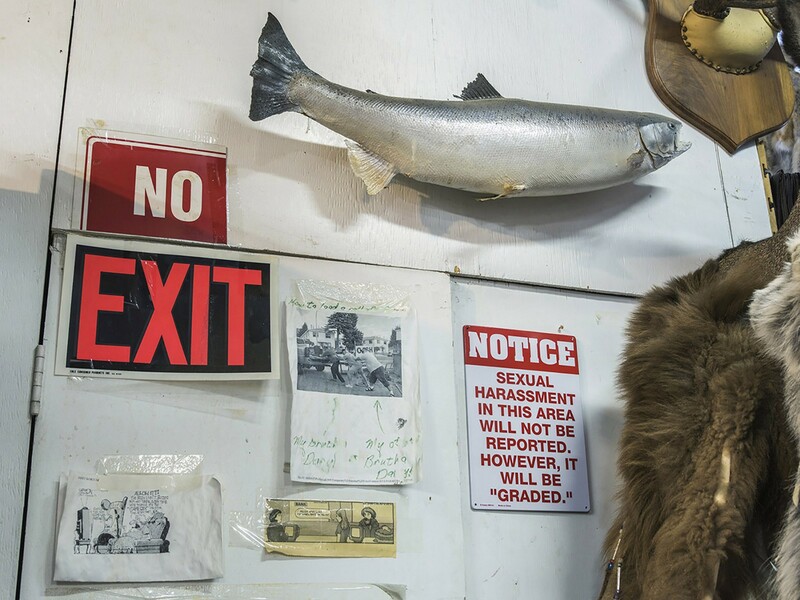 “Sign in a fur pelt store in western Montana.” © Greta Pratt, from the series The West, 2015 — present. Image courtesy of the artist. In our candid phone conversation, Pratt agreed that she has witnessed photographically the dramatic cultural shifts that have shaped the United States over the previous two decades. And while the election that ushered Donald J. Trump to the nation’s highest office didn’t impact her work directly, the election and all that has happened in the interim bring issues including identity, nationalism, and race to greater bear on how we understand ourselves and each other. That not so subtle shift is evident in her work. It falls to audiences to reckon with the moments and myths that have shaped the path we’ve cut so far, what roles or identities we perform, and how we will move forward as a nation united or divided. Roula Seikaly is an independent art writer and curator based in Berkeley, and Senior Editor at Humble Arts Foundation.